So tonight I had the privilege of seeing Quentin Tarantino's The Hateful Eight in Leicester Square, and in Ultra Panavision 70mm film. In easier words, it's about half an hour longer than the theatrical wide release and has a few changes to the edits, such as some sequences remaining in one elongated take rather than cutting away. I'll get straight to the point: it's terrific. It's quietly enthralling in its opening half, and utterly thrilling in its second. 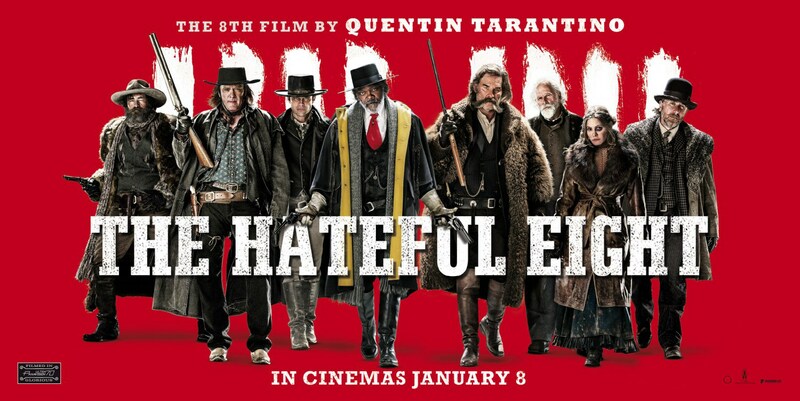 It might not be as gleefully entertaining as Pulp Fiction, or as relentlessly exhilarating as Inglourious Basterds, but where The Hateful Eight lacks in wow factor it well and truly makes up for it in terms of breathtaking visuals and wonderfully layered characters. The film is broken down into two halves, and both are very different sides of the film. The first half is small, contained and dialogue driven, while the second half is loud, explosive and packs more blood than the elevator doors in The Shining. So I'm gonna structure this review a little like that, because this is almost like watching two separate films, and so it warrants two separate reviews. After a series of cold, bleak establishing shots, Taratino's latest film title appears on the screen in his conventionally old school style, before the camera properly opens in close up on a statue of a crucified Jesus and eventually begins to pull away agonisingly slowly only to reveal Samuel L. Jackson's character sat atop a pile of bodies three men high. Little did I know at the time, but this is a fitting metaphor for the film's structure. 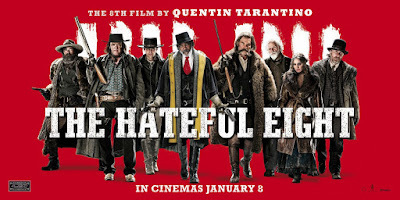 Truth be told, the first half of The Hateful Eight could be condensed down a great deal. It wouldn't necessarily make for a better film, but certainly a more invigorating first ninety minutes. The slow pace that this film adopts in its first half leads to a more rewarding outcome, sure, but for a film that spends almost all of its three hour running time either inside a stagecoach or in one isolated room, there's a hell of a lot of build up. It is perhaps unnecessary, but one thing it never is, is boring. Tarantino, much like he always does, works absolute wonders with his scripting. Characters are defined and layered early on, leaving a monumental amount of screen time to build on it further. Tarantino's wacky sense of humour comes into play from the offset, with a pin-point combination of violence and comedy setting the tone wonderfully for the second half. It's overlong, but entirely compelling. Once we arrive at the room in which we spend essentially the remainder of the film, dubbed Minnie's Haberdashery, things begin to escalate. Our protagonists (if we can call them that) sense almost immediately that something isn't quite right, but with four or five strangers surrounding them they can't quite work out what's going on, nor gather enough information to accuse the others of ill behaviour. And that's when the film's tone really clicks into place: this is a mystery film. In fact, it's almost Agatha Christie-esque in its location and narrative work, just with the generic conventions of a Western and Tarantino's trademark style slapped on top. It's an interesting and engaging first half, but where it really stands out is in its character work. Jackson's Warren represents refreshing ideologies of the American ideal of the time, and talks at length about being a black man accused of violence in a room of white men. Kurt Russell's John Ruth is mesmerised by Warren's alleged letter from Lincoln, and we understand what justice means to him through his moral core. The characters all bounce off each other excitingly well, and it sparks some fantastic writing. It can't help but feel like the set up that it is, but it does its job wonderfully well before leading into the film's most intense sequence yet. And then we cut for intermission. Damn you, QT, that twelve minute wait was almost unbearable. When we return, the dynamic has changed. Characters who once had high ground are now in peril, players who weren't suspects suddenly have motive. The game changing end to part one really allows part two to shake up the pacing, which it more than does. This isn't just a separate half, it's almost a separate film. It's also the better of the two halves by far, as Tarantino's exquisite use of 70mm film comes into real play beyond mesmerising detail (there's a moment near the beginning where we can see snowflakes settle on a horse's back, and we vividly watch as they melt away. You just wouldn't see this detail in an ordinary cinema). In the second half Tarantino brings focus into play, as certain scenes are told in one elongated shot which repeatedly flicks between shallow and deep focus, and the incomprehensibly wide frame allows for some unprecedented staging tricks. Staging is incredibly important in a film which spends most of its time in one room, and The Hateful Eight nails it seamlessly. The second half nails everything seamlessly, in fact. Tarantino can work wonders when he takes one scene and extends it hugely; the basement card game in Inglourious Basterds is the film's greatest sequence, much like the dinner at Candie's house in Django is more thrilling than the rest of the film combined. Besides one chapter long flashback, The Hateful Eight's second half is as close to real time as it comes. An eighty minute scene shown across eighty minutes in all its violent, angry, blood soaked rage, and it is brilliant. But, again, what really keeps things moving are the characters. The level of violence that The Hateful Eight offers in part two is enough to keep anyone watching, but it wouldn't actually be good unless it all counted for something. Part one's slow burn pays off, though, and we're treated to a plethora of compelling characters forced into situations in which we simply cannot predict the outcome no matter how hard we try. Tarantino, here, has laced his characters with depth and personality but left specific traits shrouded in enigma, allowing for later reveals to really matter and, as always, his cast absolutely sell it. Jackson is excellent in part two, Walton Goggins steps up to some engaging material and delivers it seamlessly, and Jennifer Jason Leigh earns all of her awards buzz in one two minute take alone. She bargains for her life while the camera remains fixed on her face, semi-circling around her again and again but always keeping her blood covered face in view. Tarantino is a master at combining both shocking and beautiful images with compelling narrative work, and The Hateful Eight is no exception. Add to that a killer soundtrack, some ingenious humour, an excellent guest performance from Channing Tatum and a final half so numbingly intense that the world around you ceases to exist, and you've got another superb film to add to Tarantino's increasingly impressive resume. This doesn't quite scale the heights of Pulp Fiction or Inglourious Basterds, but it's not far off either. To Summarise: With breathtaking cinematography, sharp scripting and a plethora of excellent performances bound to compelling characters, The Hateful Eight is another ultraviolent, blood soaked thrill ride courtesy of Quentin Tarantino's reliably exuberant direction.